Let's look at the chart below. 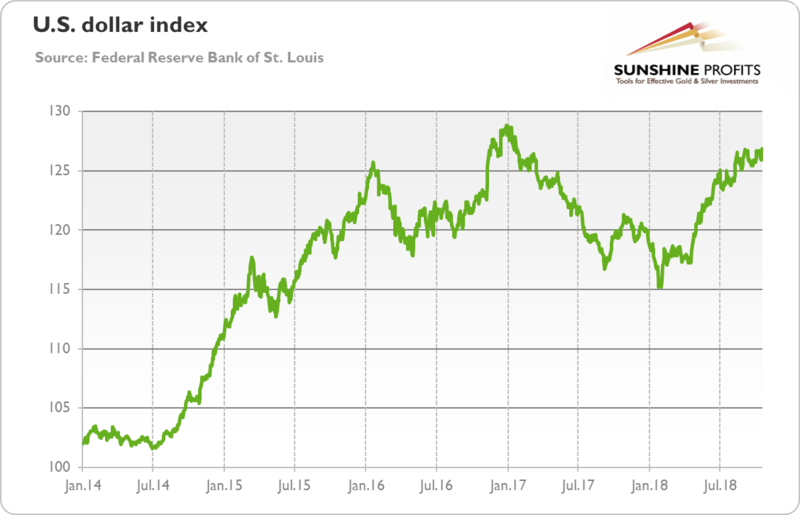 As one can see, the greenback has been in a bull market since February 2018. Yup, the chart does not lie. The US Congress widened the fiscal deficit, while President Trump engaged in trade disputes. But despite these disturbing developments for long-run economic health, the broad trade weighted US dollar index increased from 115 to almost 130 now. But why – shouldn't it decline? Not necessarily. The first reason is the American monetary policy. It might be just a coincidence, but in February 2018, Jerome Powell took reins at the Fed. The US central bank has been gradually raising the federal funds rate, putting the upward pressure on the greenback. Moreover, the new composition of the FOMC under a fresh leadership has been signaling a more hawkish tone, which lifted a market expectations of the future path of interest rates, also contributing to the dollar's strength. What is really important here is not the mere increase in interest rates, but the upsurge in relation to other economies. The chart below displays the difference between US and German 10-year government bonds. As one can see, the yield gap has widened since the mid- 2017. However the monetary policy is not everything. There is also a fiscal policy. Trump and the Congress have pursued a massive pro-cyclical fiscal expansion (composed of both the tax cuts and the increase in government spending), ballooning the budget deficit to unprecedented levels in the absence of a recession or a war. The following rise in interest rates is actually what the macroeconomic theory predicts. Higher yields attract capital from abroad which strengthens the US dollar, while weakening the gold. And this is not merely a theoretical possibility the economists model in their ivory towers. Just look at the chart below, which shows the US federal deficits and the trade weighted US dollar index. 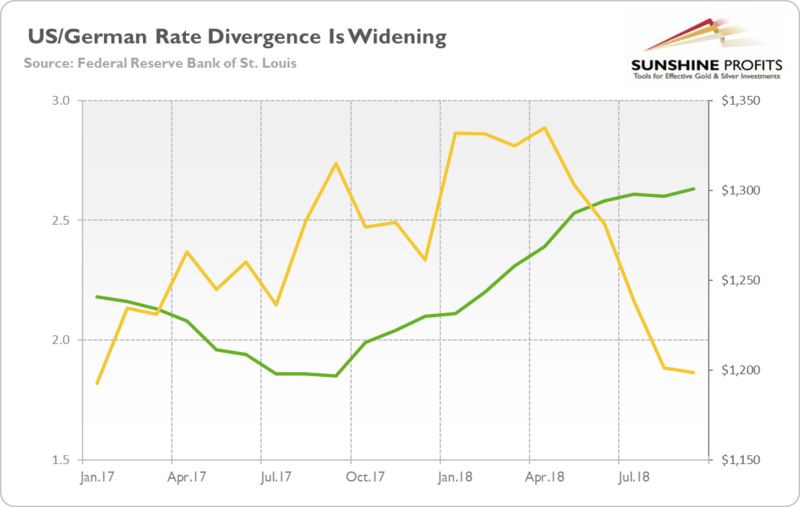 The correlation is not perfect, but this is because of what really matters for greenback and gold is the fiscal-monetary mix, not the fiscal or monetary policies in separation. So focus on period of 1981-1984, when Reagan-Volcker duo was in charge. The combination of rising deficits and monetary policy tightening made dollar rally, while gold entered its long-term bear market. 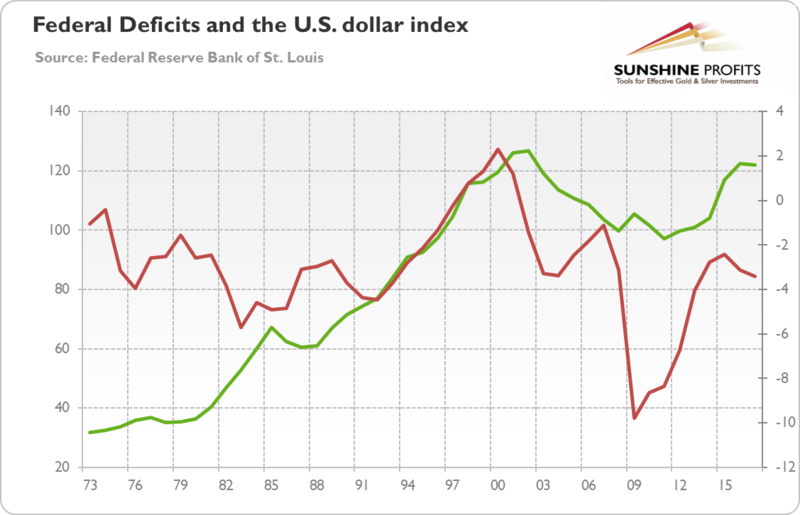 Chart 3: Federal Deficit (red line, right scale, as % of GDP) and broad trade weighted US dollar index (green line, left axis) from 1973 to 2017. ‘But what about the 2000s, when Bush has become the biggest spender in decades," you could ask. He boosted the twin deficit and public debt, but the greenback weakened, while gold started its impressive bull market. That's true, but Greenspan then conducted an easy monetary policy and slashed interest rates to very low levels. The combination of accommodative fiscal and monetary policies made investors lose their confidence in the dollar and shift their funds into the precious metals market. Last but not least, we should not forget about Trump's trade wars. He introduced import tariffs, wanting to improve the US trade balance and weaken the currency. But President, although believed to be a great businessman, does not necessarily understand all the intricacies of macroeconomics. If earning dollars is harder for foreign exporters, there will be dollar scarcity, and upward pressure on the currency while downward pressure on gold prices. In other words, dollars will remain in America, so they will not enter the international currency market. Fewer greenbacks in the market imply higher exchange rate between US dollar and other currencies, including gold. To sum up, the puzzle of strong greenback during Trump's presidency is apparent. The rise in US dollar is in line with the macroeconomic theory, which predicts that the combination of lax fiscal policy and hawkish monetary policy would lift the interest rates which should support the currency. This is bad news for gold. It implies that gold will not start rallying without material changes in the current policy mix. Another important implication is that precious metals investors should pay less attention to the geopolitical uncertainty ("Trump and his trade wars would for sure boost gold") and focus instead on macroeconomic factors.